WVU Medicine celebrated the opening of its new clinic in Fairmont with a Community Open House Saturday, Oct. 21. The $13.9 million, 25,000-square-foot outpatient center is located off Downtown Fairmont Exit 136 of I-79, near the Fairmont Gateway Connector and behind the Fairmont Federal Credit Union. It opened on Sept. 25. Visitors had a chance to meet the providers, take advantage of some low-cost and free screenings, receive flu shots, meet Monti Bear, and more. A CONNECT photo gallery of the day's activities is available here. 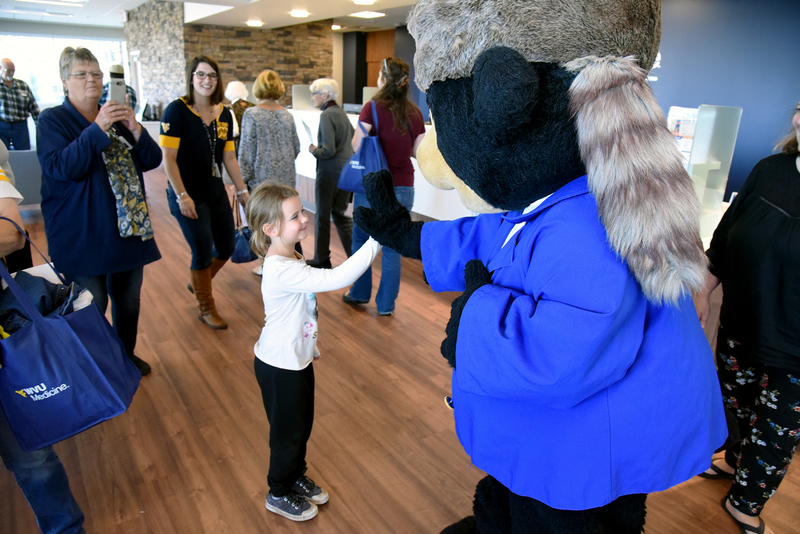 Monti Bear gets a high five from a fan during the Open House at the WVU Medicine Fairmont Clinic Oct. 21.